This Sunday: the first Mexican Jewish film at CBI, plus Super Sunday! This Sunday is a special day twice over. First of all, it’s Super Sunday. If you want to join the group of CBI congregants who will be carpooling down to Jewish Federation, contact the Ranzers. Please support Jewish Federation — they do so much to support us! If you’re not going to be at Super Sunday, or if you’re going at 8am and might be ready for a break by 11, join us for the first installation of this summer’s Bagels, Coffee, & Films at CBI. This year, member Chaim Bronstein has organized a film series featuring Mexican Jewish movies. Join us for bagels, coffee, and movies projected on a big screen (a really big one — a whole wall in our darkened, comfortable classroom) and then conversation! Each film will begin at 11:11 on a Sunday morning, giving you time to show up, get your coffee and bagel, and schmooze a little before the movie begins. This week we will also be collecting donations for Jewish Federation — so you can come to the movie and also give some tzedakah to Federation while you’re here! 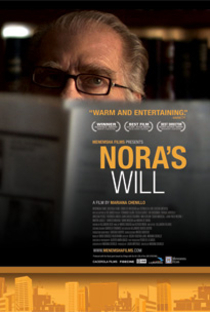 Nora’s Will is a tale of lost faith and eternal love from one of Mexico’s most talented filmmakers. When his ex-wife Nora dies right before Passover, José (Fernando Luján) is forced to stay with her body until she can be properly put to rest. He soon realizes he is part of Nora’s plan to bring her family back together for one last Passover feast, leading José to reexamine their relationship and rediscover their undying love for each other. For more: Lift Ev’ry Voice. and it will also be available on the Newsletter page of the CBI website. 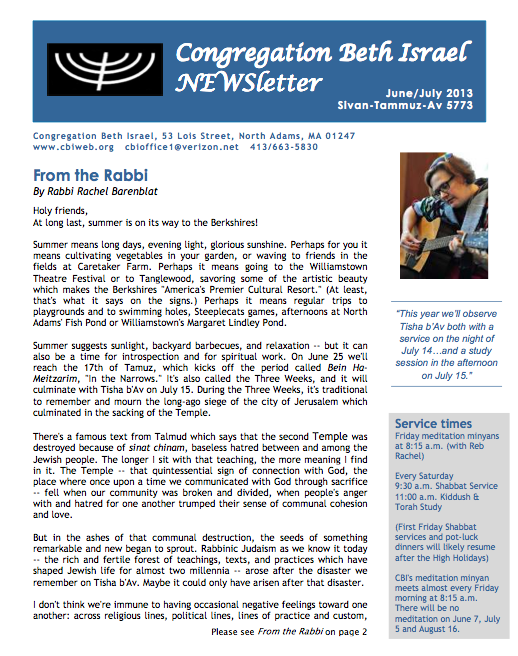 In this edition of the NEWSletter, you’ll find: a From the Rabbi column, a schedule of service times and service leaders, thank-yous and get well wishes, updates from the Cemetery Committee and Chesed (Caring) Committee, Lunch Bunch dates, volunteer opportunities, mazal tovs / congratulations to our members who have happy news, condolences to those who have suffered losses, information about our Bagels & Films series this summer, an ongoing column called Avodat b’Simchah / Serving With Joy, information on Operation Paperback and on our book discussion group, and more! A paper copy of the newsletter will be on its way to you as soon as we can get the mailing prepared & out the door. The deadline for the next issue of the newsletter is July 10; that issue will cover August and September of this year, and will come out in late July. Over the summer, please let the office know if you would like to continue receiving the newsletter on paper. We’re making this shift primarily for environmental reasons; please consider the environment as you choose whether or not to remain on our “hard copy” newsletter list. Enjoy the newsletter. May your Shabbat be sweet and full of life! There are two job openings in CBI’s education department; please disseminate widely, and if you are inclined to apply, please do so! Congregation Beth Israel, a reform congregation located in North Adams, MA, seeks to fill two positions in its education program. Applicants may apply for either or for both positions. For more information about CBI, please visit our website at http://www.cbiweb.org. To apply, please send a cover letter and resume to our Education Committee at: religiousschool.cbi@gmail.com. Applications will be accepted through May 31, 2013. 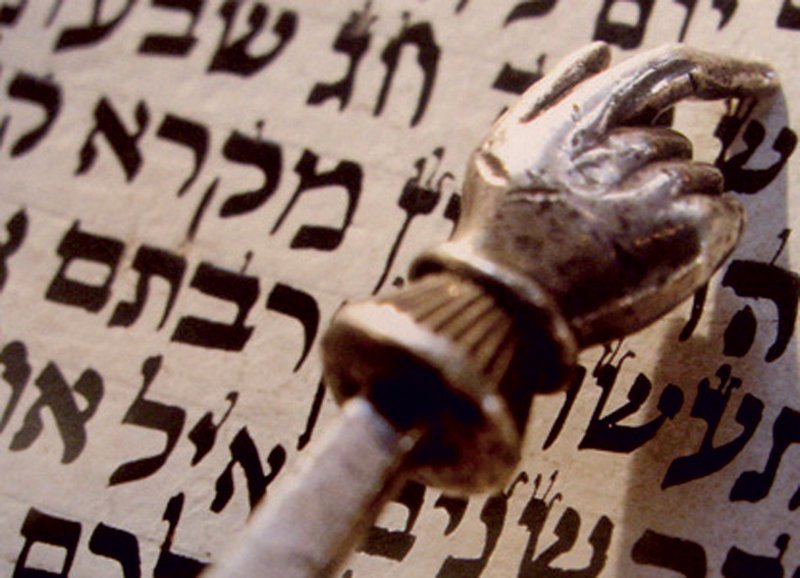 Aleph Tav is our Hebrew and Judaic Studies program for 1st through 4th graders. It runs from 3:30-5:15 on Monday afternoons during the school year, with half of each session spent on Hebrew, and half on Judaic Studies. The Aleph Tav teacher is responsible for both curriculum development and teaching both portions of the class, along with assistance from either older students or assistant teachers. Qualifications desired are graduate-level training in education or equivalent experience, and experience in Jewish education. Pay is commensurate with experience. The Education Administrator coordinates activities for all of CBI’s education programs, ranging from a monthly preschool-age program through adult education. Duties include preparation of financial reports and budgets, preparation of applications and reports for foundation grants, tracking tuition payments and supply purchases, and communicating with parents and the Board regarding the Education Program. The Education Administrator works closely with the rabbi, the Education Committee, the Family Educator, and Lead Teacher of Aleph Tav to administer the program. Qualifications desired are graduate-level training in education or equivalent experience, experience in Jewish education, and prior administrative experience. This is a full-year salaried position which averages 10 hours/week. Pay is commensurate with experience. Tomorrow night at sundown we enter into one of the most special holidays of our year: Shavuot. Shavuot comes at the end of the 49 days of the Counting of the Omer. We have counted every day between the second night of Pesach and now, eagerly crossing days off on our calendar like children anticipating a birthday. On Shavuot, we celebrate the revelation of Torah: both the once-upon-a-time revelation which our tradition tells us took place at Sinai, and the ongoing revelation which still streams into creation now if we are only willing to open our hearts to listen. Shavuot is one of the Shalosh Regalim, the Three Great Pilgrimage Festivals when we used to walk en masse to Jerusalem to make offerings to God at the Temple. This year I invite you to make your own small “pilgrimage” to our places of holy gathering and to join with community in receiving the Torah you most need this year. A midrash holds that at Sinai, for the revelation of Torah, the souls of every Jew who would ever live were all present together. May this Shavuot connect us with our ancestors and our descendants, with Jews celebrating Shavuot around the world, and with God. Jen Burt: Raising a Family on Tradition or Faith? Please join us for the Shavuot festival service on Wednesday morning, May 15 at 10 AM. 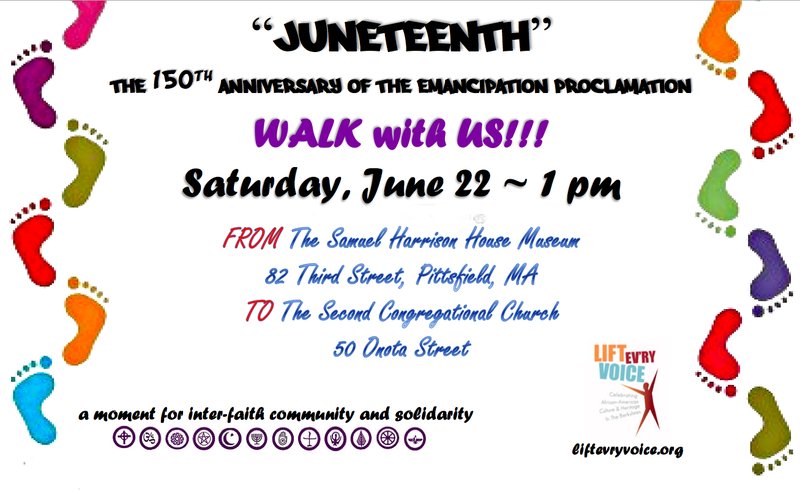 This holiday celebrates the giving of Torah and will include a dramatic reading of the Ten Commandments, Hallel, a yizkor memorial service, and a brief rendering of the Book of Ruth, the scroll associated with Shavuot. To commemorate this holiday on which dairy foods are eaten, delicious chocolate cheesecake imported from NYC will be served at kiddush! Attached please find our most recent education newsletter, compiled by Education Coordinator Susan Federspiel. It features updates from all of our religious education programs and showcases what the Hand in Hand, Aleph-Garten, Aleph-Tav, and Ne’arim students learned and did during the month of April 2013 / Iyar 5773. This issue, and all future installments of the CBI Education Newsletter, will also be shared here on the From the Rabbi blog, so if you misplace your copy, you can find them there under the “education newsletter” tag.